Unisell Corp's Pre-Holiday Sale is until December 23, 2011. Sale Hours: 10:00am to 6:00pm. Items on Sale include Perfumes, Body Wash, Soaps, Mouthwash, Shampoos, Conditioners, Luggages, Nail Polish, Deodorants, Zippo Lighters & More! 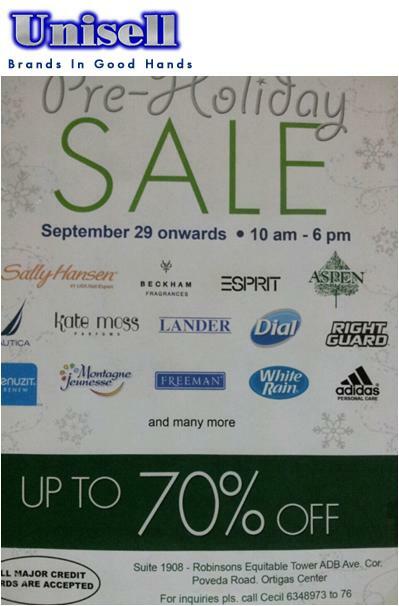 Brands on Sale include: Sally Hansen, Beckham Fragrances, Esprit, Aspen, Nautica, Kate Moss Fragrances, Lander, Dial, Right Guard, Freeman, White Rain, Adidas Personal Care and More! The Unisell Group is a marketing and distribution organization servicing consumers with personal care products, health and beauty aids, cosmetics, fragrances, bags and luggage, and smoking goods. From a small business founded in 1967 by its president, Manuel Sua, the organization has evolved into one of the most vibrant and energetic corporations. UNISELL takes pride in being one of the major companies directly supplying the country’s biggest retailers. The current network of customers includes the major chains of department stores, supermarkets, personal care stores, drugstores, and wholesalers. The Unisell sales and marketing personnel are divided into three teams: Household and Personal Care (HPC), Cosmetics and Fragrances (C&F), and Travel and Lifestyle Goods (TLG).